I've just read somewhere that there was a violent split over The Broken Shore in a reader's group -- the members either loved it or hated it. The plot unfolds slowly, which I could imagine might disappoint some readers, but that's part of the novel's charm for me. Temple fills the intervals with so much detail, with so much story, that the book is actually a pleasure to read at a leisurely pace. 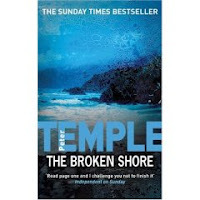 Off the two Jack Irish novels I've read plus The Broken Shore, I'd say Temple is one of the very best and most distinctive crime-fiction writers in the world. Not sure about the reasons for the violent split, but I know that so many love The Broken Shore. For me, I found it so stylistically annoying when it came to the writing that I gave up and skimmed to the end. It appeared to have a decent and thought provoking plot from my skimming, so I was left thinking that I'd missed something. However, I hate and don't support bad use of grammar, and here, it was adopted as a style. Unique perhaps, but oh so annoying to me! A decider, a bit like the plot in Shutter Island! I, on the other hand, would consider Temple the second-best prose stylist in the world of English-language crime fiction. I don't notice bad grammar as much as I do clipped sentences for some characters, which I thought worked. If a reader found the style annoying, though, I could imagine him or her growing frustrated, since the plot does unfold slowly. The clipped sentences were a feature I commented on in my review (which you can't see, yet, since it's going to be in the Estella's Revenge ezine, but it was a positive review, overall). I thought it worked. I found the whole novel fascinating and had to reread some paragraphs to figure out what he was trying to say, occasionally, but it moved quickly for me. Thanks for the note. I think I just posted a comment to your initial post about The Broken Shore. I thought the clipped speech did the work of multiple paragraphs of description about taciturn, hard-working men of few words and so on, especially with respect to Rebb. My comment about the novel's slow pace was in no way a criticism. Rather, it was an observation about the pace with which the main plot unfolds -- and the pleasure I took reading its gorgeous prose. I had to read Temple for an award I was judging. I thought I'd picked up a Ken Bruen novel. Turns out Temple and Bruen have compared notes. One of those great minds moments when I learned that. Good god, what a meeting of the minds that must have been. Does discretion keep you from revealing which Temple novel you read for the award? Those guys are both so good and their approaches different enough that I'd love to have heard them discuss their approaches to crime writing. I just finished listening to the audiobook of The Broken Shore and having the authentic accent as well as the listening experience makes the style/grammar/prose fall into place rather than stand out annoyingly. The slow pace was OK in the audiobook as it was like someone "yarning" but it was more of a shock when we finally hit the nugget of the plot and wrapped it all up in the last hour of a 12-hour audio. All in all I'd say a real fine trip to Oz. Thanks for the note, Kate. Maybe I'll look for that audio book for my next long trip. Either that, or get a car and move far out of the city, so I have a long commute every day. It's intriguing to hear that the audio version came across as someone yarning. It takes a gifted storyteller (and a reader with a good voice) to sustain that effect.